In September, the Census Bureau released its most recent Annual Surveys of State and Local Government Finance data, which provides a comprehensive picture of the funding sources of state and local governments for the 2010 fiscal year. State and local governments obtain income from a variety of sources, and the breakdown changes drastically from state to state. Proportions vary based on the types of taxes and fees administered within state borders, the types of resources within the state, the amount of intergovernmental transfers, and the policy priorities of state and local governments. For example, when a state has an abundance of natural resources, a state is able to collect large revenues from taxes on those resources that not often financed by state residents themselves. Instead, the state may be able to export the economic burden of those taxes to nonresident consumers of minerals and mineral-based products in the form of higher prices. States such as Alaska and Wyoming can do so without driving much economic activity out of the state due to the fact that resources such as natural gas and coal are relatively immobile. Other types of taxes that a state government may rely heavily upon are personal income taxes, corporate income taxes, property taxes, or sales and gross receipts taxes. Here, we provide an overview of where state and local governments together obtain their tax revenues (a subcategory of overall revenues). State and local governments tend to obtain the largest portion of tax revenues from property taxes and sales and gross receipts taxes. Another large source of revenue is individual income taxes. 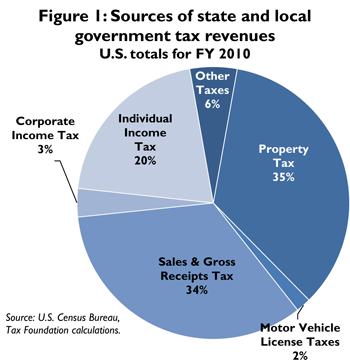 Figure 1 provides a breakdown of sources for total U.S. state and local tax revenues in fiscal year 2010—35 percent came from property taxes and 34 percent came from sales and gross receipts taxes. Local government tax revenues tend to be mainly funded by property taxes—in 2010, local government obtained just over 75 percent of their 2010 tax revenues from property taxes. The main source of revenue for state governments, however, was taxes on sales and gross receipts. In 2010, the states received just under half of their tax revenues from sales and gross receipts taxes. Table 1, at the end of this Fiscal Fact, outlines the proportions of state and local tax revenues derived from various types of taxes for all fifty states and the District of Columbia. Table 2 demonstrates how different sources of state and local tax revenues within the U.S. have changed over time. Property taxes were the most prominent source of state and local tax revenues in fiscal year 2010. This category includes both commercial and residential real estate in addition to personal property tax revenues obtained from taxes on cars, boats, etc. Residential and commercial real estate are often a source of local tax revenue, while personal property taxes are often a source of state tax revenue. In fiscal year 2010, New Hampshire was the state that relied most heavily on property taxes, with over 64 percent of total tax revenues coming from this source. Rounding out the top five were New Jersey (48.4 percent), Vermont (45.9 percent), Rhode Island (45.6 percent), and Texas (45.2 percent). The states that relied least on property tax revenues were Arkansas (18.3 percent), Delaware (18.6 percent), Alabama (19.4 percent), North Dakota (19.8 percent), and New Mexico (19.8 percent). Even the states that are least dependent on property taxes for state and local tax revenue still obtained nearly one-fifth of state and local tax revenues from this source. Sales and gross receipts taxes are another main source of state and local government tax revenue. This category includes both general sales and selective sales taxes. General sales taxes are levied on “all types good and services” (subject to certain exemptions). Selective sales taxes are most often collected on alcoholic beverages, amusements, insurance, motor fuels, pari-mutuels, public utilities, and tobacco products. The state with the highest proportion of tax revenues from sales and gross receipts taxes in 2010 was Washington, with over 60 percent derived from this source. After Washington, the states that relied most heavily on these types of taxes were Tennessee (56.8 percent), Louisiana, (54.0 percent), South Dakota (53.6 percent), and Arkansas (50.5 percent). Oregon was the state that had the smallest proportion of state and local tax revenues coming from sales and gross receipts taxes (only 10 percent). The remaining four were Alaska (11.0 percent), Delaware (13.2 percent), New Hampshire (16.0 percent), and Montana (16.8 percent). In 2010, 20 percent of total U.S. state and local tax revenues were collected from personal income taxes. The top five states with the largest share of tax revenues from this source were Oregon (37.7 percent), Maryland (35.6 percent), New York (31.2 percent), Kentucky (30.4 percent), and Massachusetts (30.3 percent). The states that were the least dependent on personal income tax were the seven with no state-level income tax—Alaska, Florida, Nevada, South Dakota, Texas, Washington, and Wyoming. Corporate income taxes make up a very small portion of state and local tax revenues across the U.S. (only 3 percent of total in 2010). The state that depends most heavily on corporate income taxes is Alaska, and only 10.4 percent of Alaskan state and local tax revenues are derived from this source. After Alaska, the states that depended most on corporate income taxes for state and local tax revenue were New Hampshire (10.0 percent), New York (6.7 percent), Massachusetts (5.5 percent), and California (5.3 percent). Texas, Washington, Wyoming, and Nevada have no state-level corporate income tax. After these four, Ohio is the state the depends the least on corporate income tax for state and local tax revenues, coming in at under 1 percent. Another small source of state and local government tax revenues are taxes on motor vehicle licenses. Oklahoma relied most heavily on these types of taxes, with 5.1 percent of tax revenues coming from this source. Following Oklahoma were Montana (4.6 percent), Iowa (4.1 percent), Oregon (3.8 percent), and Utah (3.5 percent). West Virginia, Louisiana, New York, Connecticut, and Georgia relied least on motor vehicle license taxes. States are also able to obtain tax revenue from a variety of other sources, including severance taxes on natural resources and various types of license taxes (such as Alaska and Delaware, respectively). License taxes include those levied on motor vehicle licenses, business and corporation licenses, or fishing and hunting licenses. Still other types of taxes not cited above that provide revenue to states are documentary and stock transfer taxes and estate, gift, or inheritance taxes. Alaska depended most on “other” types of taxes for state and local tax revenue in 2010 (56.0 percent, with most coming from severance taxes), followed by Delaware (37.4 percent, with a majority from license taxes), North Dakota (35.5 percent), Wyoming (23.8 percent), and West Virginia (14.0 percent). Georgia, Hawaii, Rhode Island, Wisconsin, and Michigan relied least on “other” types of taxes for state and local tax revenue. Source: Census Bureau, Tax Foundation calculations. U.S. Census Bureau, State & Local Government Finance, fiscal year 2010, http://www.census.gov/govs/estimate/. Elizabeth Malm and Gerald Prante, Annual State-Local Tax Burden Ranking, Tax Foundation Background Paper No. 65 (October 2012), https://files.taxfoundation.org/docs/BP65_2010_Burdens_Report.pdf. Gerald Prante, Where Do State and Local Governments Get Their Tax Revenue?, Tax Foundation Fiscal Fact No. 194 (Oct. 9, 2009), https://taxfoundation.org/article/where-do-state-and-local-governments-get-their-tax-revenue. See also Ryan Forster & Kail Padgitt, Where Do State and Local Governments Get Their Tax Revenues?, Tax Foundation Fiscal Fact No. 242 (August 27, 2010), https://files.taxfoundation.org/docs/ff242.pdf. See Prante, supra note 2. U.S. Census Bureau, Definitions, State Government Tax Collections, http://www.census.gov/govs/statetax/definitions.html#s. Washington, D.C. is not included in rankings, but if it were, it would be ranked fourth in terms of dependence on corporate income taxes for local tax revenue. Washington, D.C. is not included in rankings, but if it were, it would fall between West Virginia and Louisiana in this category. U.S. Census Bureau, License Taxes, Definitions, State and Local Government Finance database, http://www.census.gov/govs/estimate/definitions.html#l.